A strange Hawaii incident involving a minor theft has grown into a scandal that has drawn national attention, toppled those in power, raised questions of improprieties in the city prosecutor’s office, and rattled state and federal law enforcement. Many stand accused. And it all happened because BC Law’s Alexander Silvert ’84 was paying attention. Federal defender Alexander Silvert could tell his client, Gerard Puana, was anxious the moment he walked into his office. Puana had good reason to be worried. He stood accused by the US Attorney’s Office of stealing Honolulu Police Chief Louis Kealoha’s mailbox. Not only that, Kealoha and his wife, Katherine, one of the highest ranking city prosecutors in Hawaii, had surveillance video of the alleged theft. “This looked like a slam dunk for the government,” Silvert said. He didn’t know it then, but Silvert was about to uncover what could go down as the largest public corruption case in Hawaii’s history. Silvert thought Puana was looking at a guilty plea with a fight at sentencing over just how hard the judge should throw the book at his client, someone who supposedly victimized a well-to-do law enforcement couple. This story begins in 2007, long before the alleged mailbox theft, with a family dispute over money. Gerard Puana had given tens of thousands of dollars from his savings to Katherine Kealoha, his niece, to invest on his behalf. Two years later, Kealoha helped Puana’s mother obtain a reverse mortgage on her home so that she could buy her son a condominium. Part of the deal included Kealoha using some of the money to consolidate her own debt. Over time, however, the Puanas began to suspect something was amiss. Hundreds of thousands of dollars had disappeared, and the outstanding balance on the mortgage had ballooned due to missed payments. Puana’s mother would eventually lose her home. The simmering family tension erupted in March 2013, when the Puanas filed suit against Kealoha alleging fraud and financial elder abuse. Three months later, on June 19, she was under oath for what was supposed to be the first of two days of depositions with the Puanas’ civil attorney. The attorney never got a second chance at the interview. Instead, the Kealohas’ mailbox was stolen June 21 and a few days later Puana was arrested for its theft. 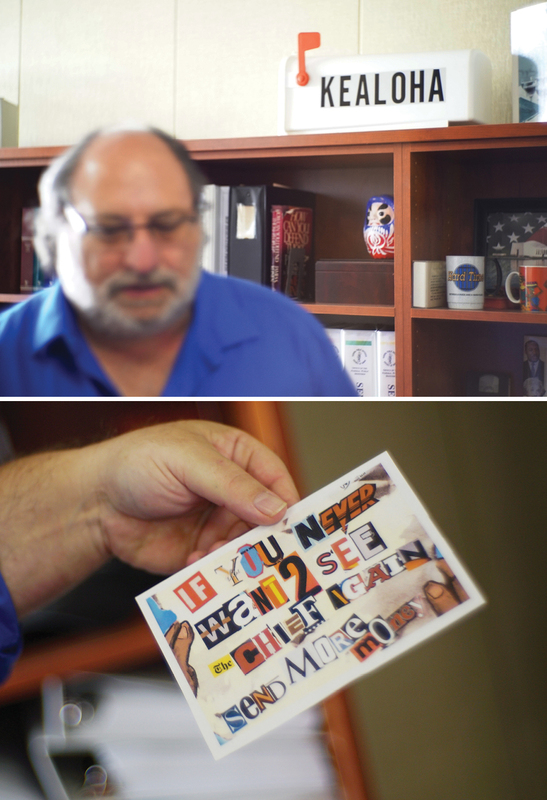 Ali Silvert knew his client was anxious the first time they met to discuss the case. And why wouldn’t he be? Stealing a mailbox is a federal offense, and it was Puana’s word versus that of his niece, a powerful prosecutor married to the police chief of the twentieth largest department in the US with nearly 2,000 officers at his command. The next break came as Silvert’s team began researching the mailbox itself. When Katherine Kealoha reported the crime, she told Honolulu police that the mailbox was a Gaines brand worth an estimated $380. An appraiser for the HPD confirmed the amount. The problem was, that wasn’t the mailbox that had been in front of theKealohas’ home. Based on pictures of the mailbox pedestal, old images from Google Maps, and an inquiry to the Gaines company, investigators determined that Kealoha wasn’t being honest. Her mailbox was a different brand and retailed for around $150. So the question needed to be asked: Why lie about the mailbox? There were other irregularities throughout the HPD’s investigation. Police reports were missing, chain-of-custody reports were altered. And timelines didn’t match up. For instance, police were at the house investigating the crime hours before Kealoha called 911 to report the mailbox was missing. Even the officers assigned to the case made Silvert suspicious. 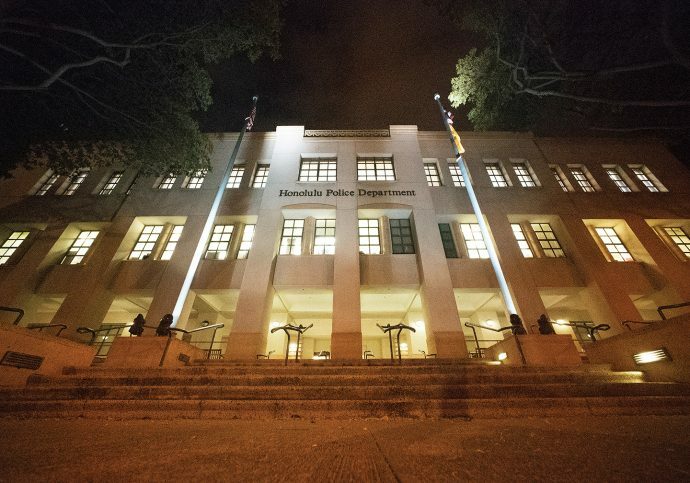 It was a relatively minor crime, yet some of the top cops in Louis Kealoha’s department were taking part in the investigation, including two homicide detectives and several members of a secretive unit that conducts surveillance and reports directly to the chief. When Puana was arrested—eight days after the mailbox disappeared—it was by a group of plainclothes and uniformed officers who cuffed him in a church parking lot. Puana, who had suspected he was being tailed, would later provide Silvert with photos of undercover officers tracking his movements around the time of the mailbox theft. The police eventually turned the mailbox case over to the federal authorities, the US Postal Inspection Service, which took the investigation and ran with it, relying almost entirely on the evidence supplied by the HPD. It wasn’t hard for the US Attorney to secure an indictment against Gerard Puana. 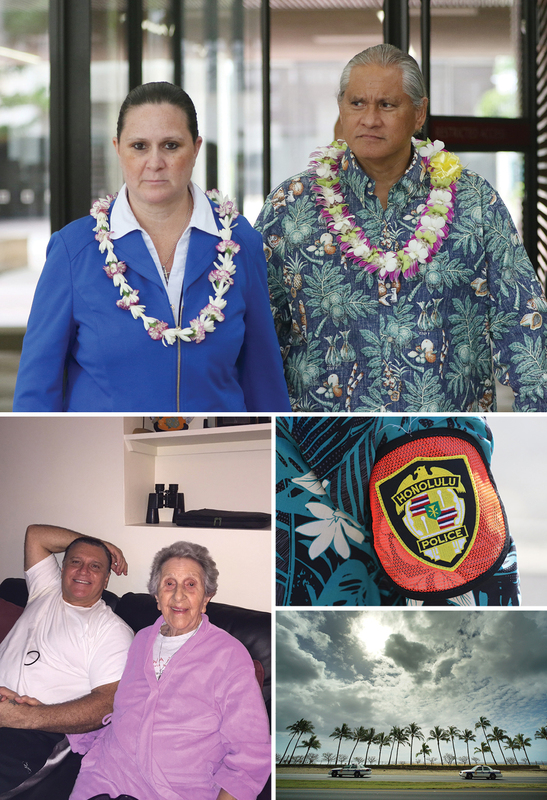 Clockwise, from top, city prosecutor Katherine Kealoha and former Honolulu Police Chief Louis Kealoha are accused of multiple crimes; symbols of the chief’s one-time empire; Gerard Puana and his mother, Florence. Puana’s trial was set for December 2014. Silvert wasn’t going to be satisfied with a simple not guilty verdict, given what he knew about the Kealohas. It wasn’t in his nature to take injustice sitting down. Silvert was born in Argentina and raised mostly in Vermont and New York City by parents who were both college professors. His father, he said, was “a John F. Kennedy Democrat” and his mother, “left of that,” which informed their son’s politics from a young age. It also played a role in his ultimate career choice. One of Silvert’s early memories is of getting tear-gassed with his mother during a Vietnam War protest in Washington, DC, in 1972. He was twelve years old, and recalls being disappointed that the press covered the event in a way that he felt was “sympathetic” to the Nixon administration. 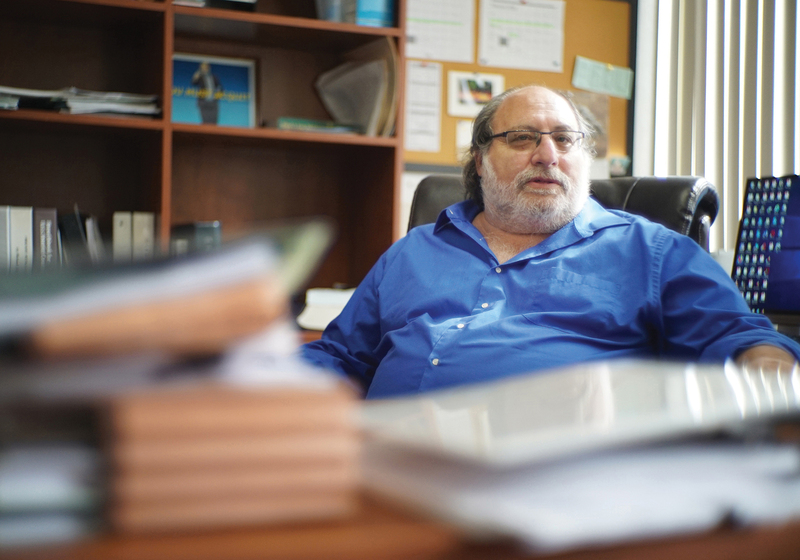 BC Law Professor Zygmunt Plater remembers Silvert at law school as “a smart, energetic, progressive activist.” After marrying classmate Diana Warrington ’84, the couple settled in her home state of Hawaii, where she became a judge and he a federal defender. He’s always looking for ways to tilt the scale, even if only a little, he said. That’s what made Puana’s case a perfect fit for him. It was clear from the beginning of Puana’s trial that the US Attorney’s Office didn’t know about Silvert’s findings. The lead attorney, Les Osborne, fell ill the day of opening arguments so Assistant US Attorney Larry Tong took his place. Tong told the jury that the police chief and his wife were the victims of a bitter uncle locked in a financial dispute with Katherine Kealoha. It really came down to whom the jury believed: the police or Puana. “The case should not take too long,” Tong said. The first person to take the witness stand was Niall Silva, a retired HPD officer who at the time of the alleged theft was a member of the department’s secretive intelligence unit assigned to investigate the case. Silvert pinned Silva down during cross, and got him to admit to falsifying police reports. “What’s done is done, sir,” Silva said. It was a key moment in the case. The next one came when Louis Kealoha, who had traded in his badge and gun that day for a suit and tie, was called by the prosecution to the witness stand. Tong played the video of the theft for Kealoha so that he could identify for the jury that the perpetrator was his wife’s uncle, Gerard Puana, who was sitting in the courtroom before him. For his part, Silvert kept his eyes on the jurors as the footage rolled. A number of them looked at the man stealing the mailbox and then to Puana with quizzical looks on their faces. From top, the Kealohas’ mailbox was one of the first clues that Silvert followed; why had they lied about its brand and price? An editorial cartoon in Civil Beat objecting to Police Chief Kealoha’s generous severance package. Then Tong asked Kealoha, a police officer with nearly thirty-two years of experience and a PhD from the University of Southern California, how he was able to recognize Puana from the surveillance video. Kealoha replied that Puana looked the same as he did when he was charged for breaking into a neighbor’s house. Silvert, flabbergasted, slammed his hand on the table and called for a mistrial. Kealoha’s statement was clearly prejudicial, and Silvert felt it went too far in unfairly tainting the jury’s perception of Puana. Surprised though Silvert was, he suspected that Kealoha knowingly misspoke, that he wanted to throw the trial so that nothing more would come out about his wife, who was expected to take the witness stand next. After the mistrial, Silvert had a decision to make. He could wait for the US Attorney’s Office to file new charges against Puana, or he could share his findings with the prosecutors to see if they’d dismiss the charges on their own. He chose the latter. Les Osborne, the lead prosecutor in the case who has since retired, said Silvert laid out his evidence and told him what his witnesses would swear to on the stand during a second trial. It began to dawn on Osborne and the others in the room that they had been duped. The US Attorney’s Office decided to dismiss the charges against Puana—“morally and ethically, there was no other choice,” Osborne said—and they did so with prejudice, meaning they could not re-file even if they wanted to. The prosecutors also contacted the FBI, the federal agency responsible for investigating criminal corruption in public institutions. It was an embarrassing turn for what Osborne and his team had believed was a simple case of a stolen mailbox. “There was absolutely no indication of any impropriety,” Osborne said. “There was a film of somebody approaching a mailbox, breaking the mailbox [off the pedestal], and driving away. That was it.” In his nearly forty years as a prosecutor, he said, he never anticipated being lied to by a police chief, a prosecutor, and several other officers. It just doesn’t happen, he’d thought. A team of prosecutors from the US Attorney’s Office in San Diego was assigned to run the investigation, and the Hawaii office was recused. By December 2016, they had their first guilty plea, from retired HPD officer Silva, who admitted to falsifying police reports, lying to federal investigators, and giving false testimony while on the witness stand during Puana’s trial. He also agreed to cooperate. Less than a year later he would be in court answering to criminal charges. On Oct. 20, 2017, a federal grand jury returned a twenty-count indictment against Louis and Katherine Kealoha as well as four other officers who were part of the elite criminal intelligence squadron that had gained a reputation over the years as the chief’s personal goon squad. Silva had been a member of that unit before his retirement. The allegations were worse than anyone anticipated. Even Silvert, who had an inside view on the case, was surprised. In addition to the alleged mailbox conspiracy and cover-up, federal prosecutors accused the Kealohas of serious financial crimes, including bank fraud and identity theft. And the Puanas weren’t the only alleged victims. Katherine Kealoha was accused of bilking two minors, over whom she had had guardianship, out of nearly $150,000 their father had left them when he died. According to the indictment, the Kealohas used the money stolen from the Puanas and the two children to help maintain a lavish lifestyle, which included a $2 million house in an affluent neighborhood where celebrities like golf superstar Michelle Wie and Hawaii Five-O actor Daniel Dae Kim owned homes. Among the Kealohas’ questionable expenses were car payments for a Mercedes and Maserati, Elton John concert tickets, and the $26,394.80 brunch tab at the Sheraton Waikiki when Louis Kealoha was named police chief. During a press conference on the federal courthouse steps in Honolulu, Alana Robinson, the acting US Attorney for the District of San Diego, described the allegations as a “complex web of fraud, deception, and obstruction” that was carried out by a husband and wife who were desperate to maintain their self-professed status as a power couple. She said they had used their powers to undermine the rule of law and cast a shadow over the HPD. But the feds weren’t done. A new federal grand jury was empaneled immediately after the indictment to ferret out further corruption. Investigators have turned their attention to Honolulu Prosecuting Attorney Keith Kaneshiro’s office, where Katherine Kealoha is still employed as a deputy prosecutor, although she is currently on leave without pay. Witnesses have been called before the grand jury to discuss a speeding ticket she dismissed for an acquaintance, and Kaneshiro’s attempts to cover for her by saying it was part of an investigation into police officers abusing overtime. Prosecutors have also called witnesses to answer questions about a questionable transaction involving one of Kaneshiro’s campaign donors and the sale of a safe haven for women he created. In an ironic twist, a Katherine Kealoha alleged victim, Ranson Taito, one of the siblings whose trust she allegedly pilfered, has also pleaded guilty to criminal charges. He admitted to helping Kealoha cover-up the theft of their trust money by signing fraudulent documents and lying to the federal grand jury about receiving the funds. He said he lied because he believed his trusted “auntie” Kealoha when she told him that his mother, who had a past criminal record, would go to jail if he didn’t do what she said. Through everything, the Kealohas have maintained their innocence, pleading not guilty to all the charges levied against them. The other four alleged co-conspirators in the mailbox case have also pleaded not guilty. Although the Kealoha scandal is still unfolding, the ramifications have been far-reaching. Louis Kealoha’s resignation paved the way for new Honolulu Police Chief Susan Ballard, who is the first woman to take the helm of the department since it was formed in 1932. She has already dismantled the criminal intelligence unit at the center of the alleged conspiracy. The Honolulu Police Commission, too, has evolved. Honolulu’s mayor, under political pressure, appointed new members to the commission who were unafraid to challenge the status quo, and voters approved a ballot measure that gave the commission more authority to investigate corruption and remove a police chief if need be. 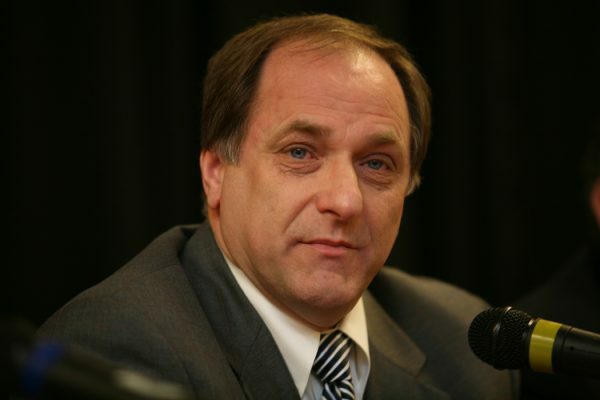 For his part, Silvert maintains an active role in the federal case, albeit not directly. He’s become a vocal advocate for more oversight and accountability of police actions, particularly within the HPD. He publicly called on several police commissioners to resign after the Kealohas were indicted.